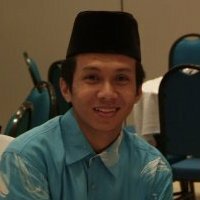 Uniquely Kelantan: What’s Hot and What’s Not..? Here were some of my credit and discredit of what changes or blunders upon implementation under Islamic-approaches’ of Kelantan state government almost 20 years in the driving seat. 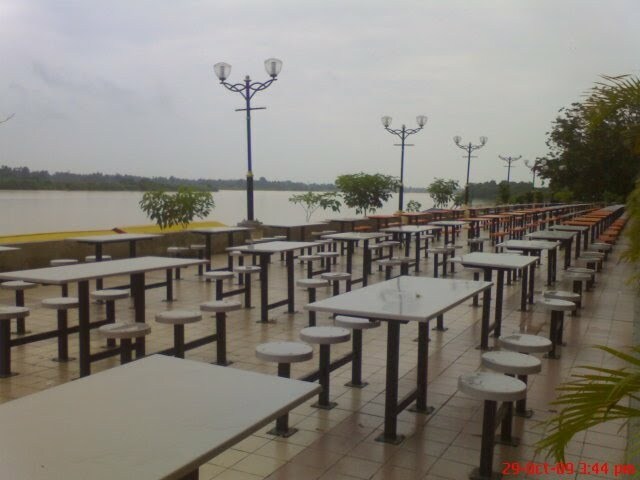 The PAS government leading this Mecca-Veranda as dubbed state appear fruitful after a lot of changes for its dwellers. 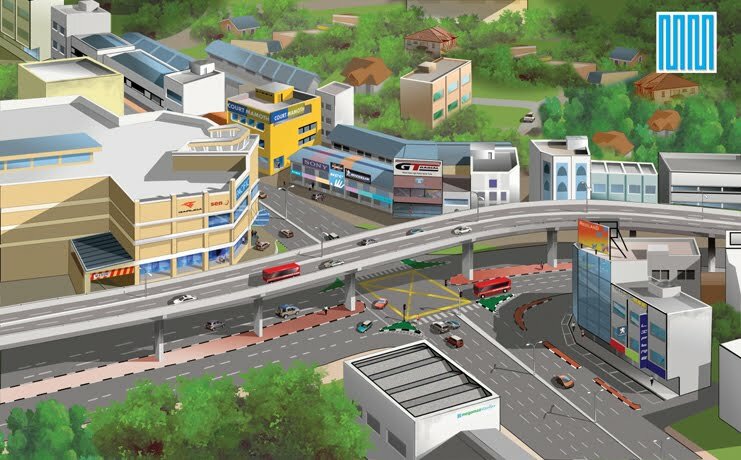 The implementation of some mega project hopes to be achieved parallel with 2015 Growth Kelantan state. This work of art was my little effort and contribution to this adorable state and I was described it as Uniquely Kelantan: Republic of Islam: Kota Bharu The Islamic City, in particular. This is newly-ads of Wimax’s “Sudah Potong..?” (Have you cute it off..?) brilliantly display in Jawi (Arabic) font and many other ads in Jawi (Arabic) font even in Chinese shop-houses. Kelantan-Style! Like No Other! 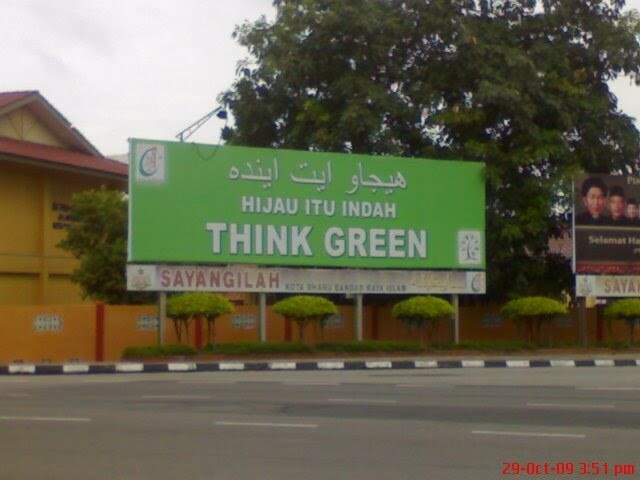 Green’s Thinking Ads at Jalan Padang Garong shows us the needs for conservation and restoration efforts to save the earth widely. Not narrow-minded of political-related ads! 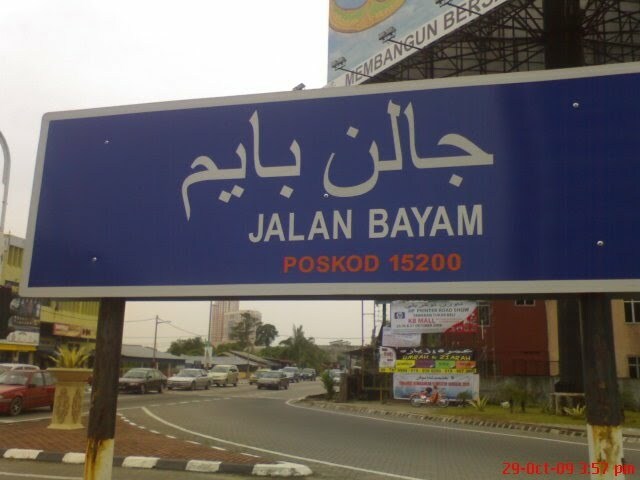 The newly-erected road signboard in Kota Bharu entirely highlighting the Jawi (Arabic) font as a main font to the viewers and standard font relegated to the bottom! State government’s effort to augment Jawi (Arabic) usage was given applause. This brilliant-fashion is not available in Bangi! Fara Fauzana’s Hot FM through ‘Kelantanization-Islamic process (in shawl) as a pre-requisite for displaying ads in Kelantan-wholly. 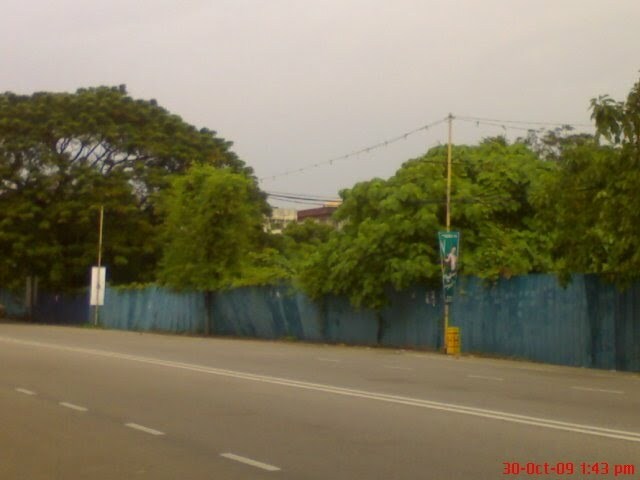 This ads located at Jalan Stadium in a giant billboard in front of Kelantan Police Headquaters. Before this, Adibah Noor’s The Store Ads and Maya Karin’s Celcom Territory Ads had through this ‘weird’ process. Like No Other! Kalahari Desert! State government innovative approach of planting dates trees circulating at Kijang Roudabout of central Kota Bharu. This trees symbolizes the Islamic element to be traditionally-assimilated in Kelantan good-governance! 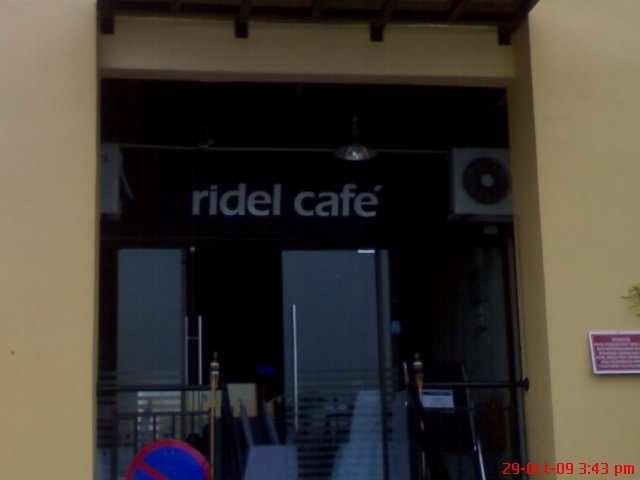 Ridel Hotel Cafe depicts that upper class people’s standard cafe still available in Kelantan despite mainstream media negatively labeling Kelantan as poverty-stricken state! Malicious Media of Malaysia! This Ridel Hotel Avenue alike of Bangsar’s Jalan Telawi, adjacent to Kelantan riverbanks congregating KL-type people to flock in. Drink..? Sorry, There were no Vodka and Vintage! 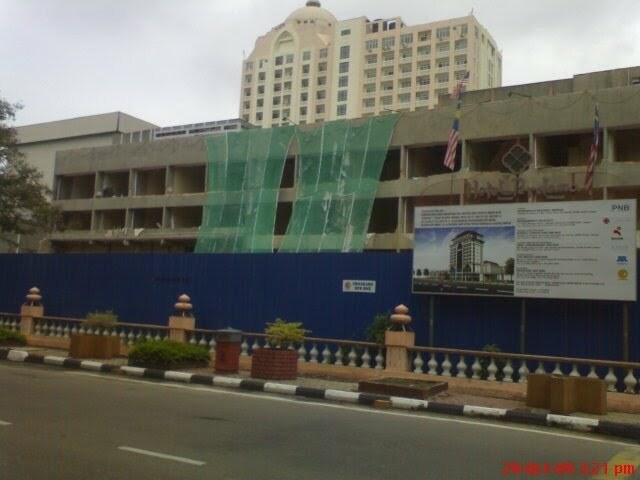 Old-fashioned Perdana Hotel was closed in order to pave way for re-constructing works done by foreign contractors. Look the blueprint below. 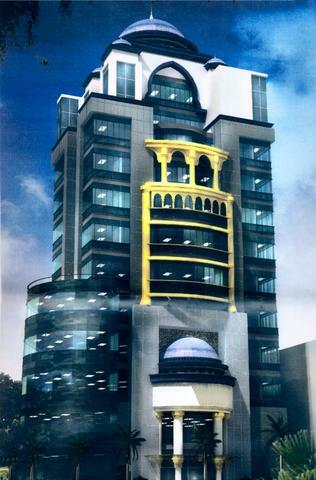 The 13 floors new hotel building built next to old 3 floors building is hopes to accommodate numerous reservation lot as it will upgrading star-status to 5. The project started on June this year and predicted to be accomplished by 2011. First flyover in-waiting at Jalan Hamzah, Kota Bharu en route starting from second Sultan Yahya Petra Bridge (under construction) to Sultan Yahya Petra Road in front of Billion Hypermart. 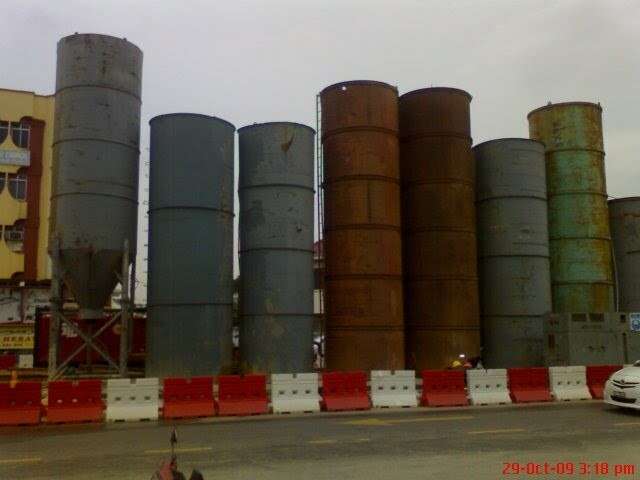 Megatone concrete mould get ready to flush off in front of old Jalan Hamzah Bus Terminal. This to-be-accomplish as scheduled 2012’s flyover will reduce massive congestion during peak hours to the Sultan Yahya Petra bridge. This is final touch of first ever Kota Bharu flyover sited at Jalan Sultan Ibrahim traffic-light in front of KB Mall Hypermart. (KL, don’t grinned sarcastic).Please click this links for details. Aged and awful Jalan Hamzah Bus Terminal shrouding illustrates the construction begin to embarks it first demolition works for their old premises. Temporary terminal located opposite to Tesco mart. 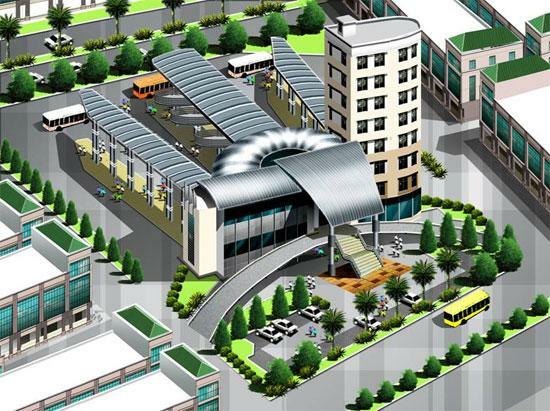 This new terminal project expected to lodge abundant passengers in times of festive season. New sport complex for Kelantanese! Artistic blueprint shows new roofed stadium located in the new-developed area in Tunjung brought some cheer to all Kelantan football fans after 30 years dwelling old-port of jammed-packed Sultan Muhammed-IV Stadium. This project is expect to have it own Kelantan-identity and not instant-project of Sultan Mizan Stadium in Gong Badak. Bumper to Bumper! 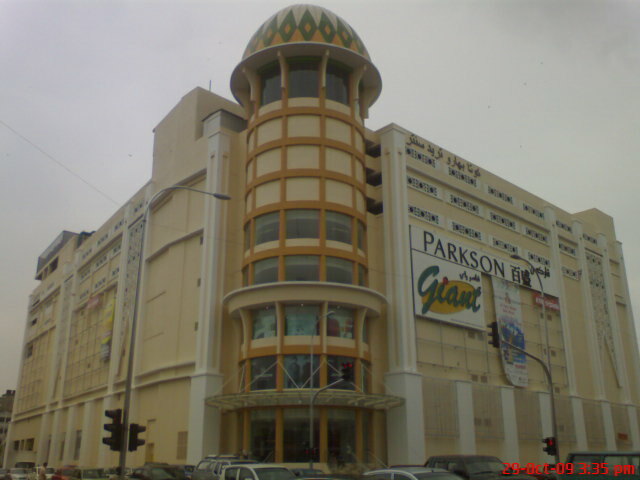 The KBTC’s Parkson hypermarket famous for having most horrifying and gut-wrenching parking ramps in Malaysia and was hail as if uphill Genting Highland summit! The F-class contractors being questioned for this worse-case- blunders! Watch Out! Safety measures! 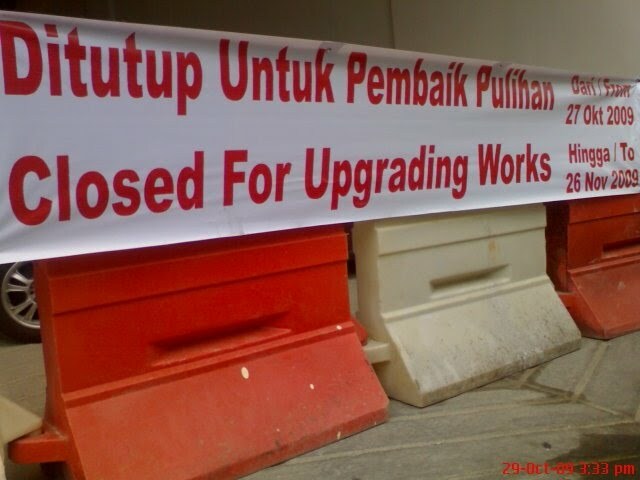 At last, the management decide to close this most dangerous parking upper stage for upgrading works. It was reported that in average of twice a week bumper to bumper ‘kissing’ accidents happened before it was closed! Nasty gearing up! Another Project By…. 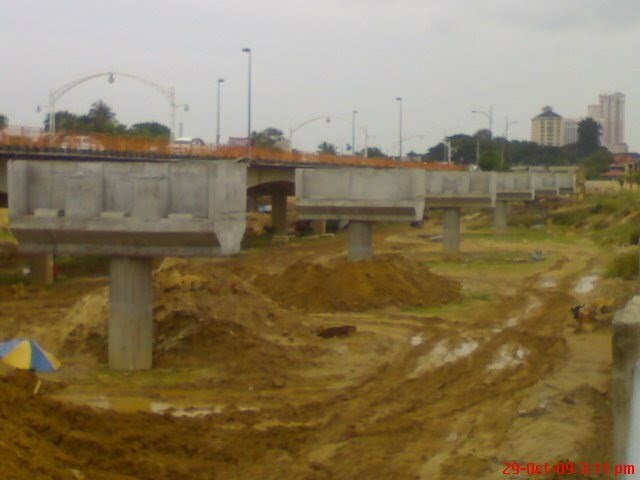 The so-long piling process of 2nd Sultan Yahya Petra Bridge project were slammed by Kelantanese entirely for it ‘political sweet charity’ election project. The ground-breaking ceremony was done on 2005 and expected to be accomplishes on 2010. What? Is this 2010? 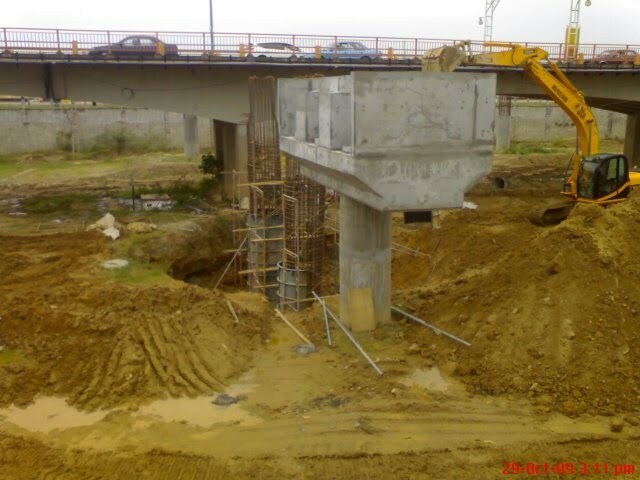 This 2009 shows the newly-concreted main pillar and it take so long for one pillar to be erected! Perhaps, this can be another subject for campaigning purposes (sweet charity) by political party in their manifesto in the next 13th General Election. When its new due date? by 2020? 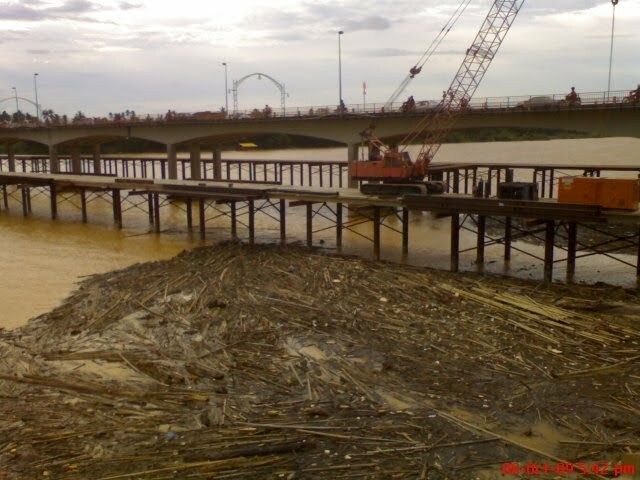 Floating bamboo stuck off at Kelantan River. The piling process going nowhere after reported that two piling earthed held for a week to make way for bulldozer road. Futile long-term bridge project and it was unpredictable when the due date that the project became reality instead of political-agenda. Zooming to Pasir Pekan. After four years silly works seem going to Mars (sarcastic). 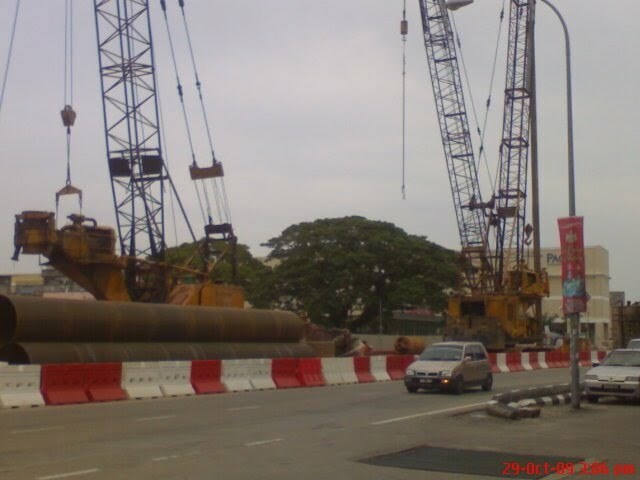 Only bulldozer road for piling process done and it take four years to do this. Is this we called mega projects? Thank You REDLAND for the bribe-bridge project! The Pelangi Mall still waiting for it D-Day to be officially opened for public after its mega riverside project accomplished on last year. 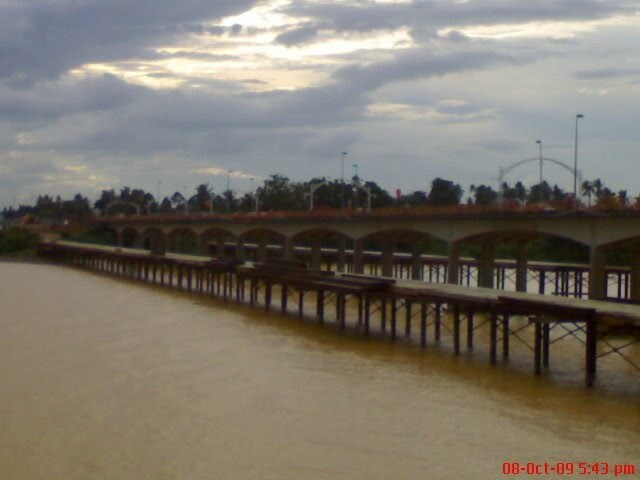 Reported that the management still waiting for the CFs and some quote as saying that there was no interests by investors for a reasons of geographical-location far away from central Kota Bharu. PANORAMA-IMPAIRED! Where is the dome? 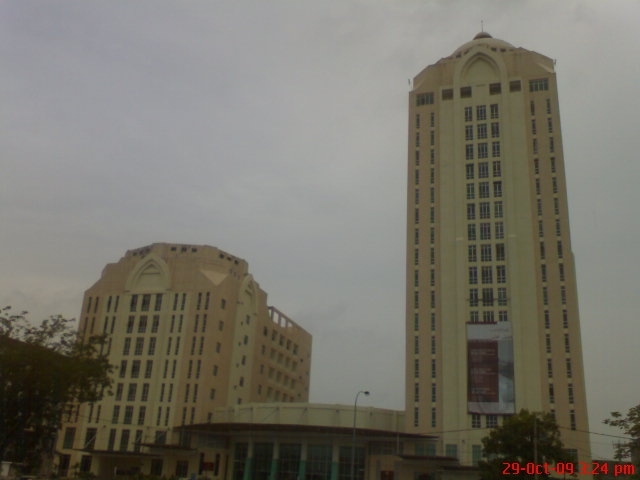 The Kelantan Trade Center dubbed as Kelantan’s Twin Tower still waiting for its left-dome after starting its operation on last year. Its look like weird as it conceal the roof under the sunbeam. See the whole project below. The final blueprint shows the dome consists of three segments area of convention center (mid), real estate plaza (left) and 19 floors hotel (right). 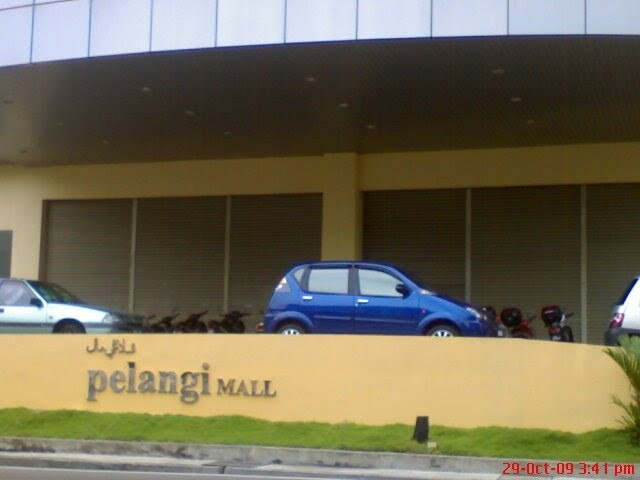 Perdana Specialist on the left and Perdana Hotel on the right side. 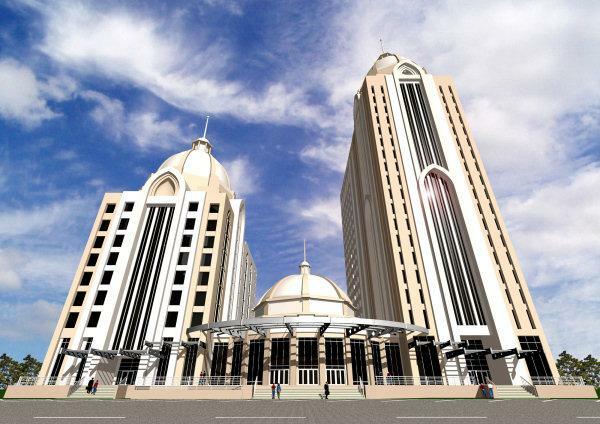 The newly-progress Kota Bharu Trade Center seem not the same ones with the illustration by the artist impression (see the image below). This KBTC’s whole project 100 percently accomplished last years and officially open for public last Ramadhan but without its ‘Antenna’. What is supposed to be is… This! 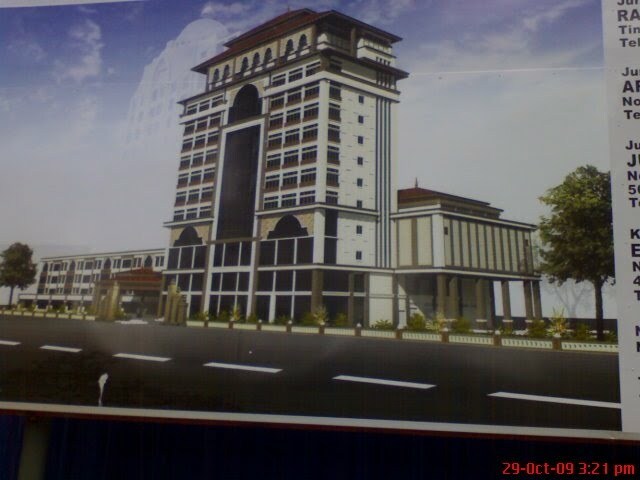 Look, where is the artist impression of the back-phase of 20 floors hotel..? or it was converted into Plan B? 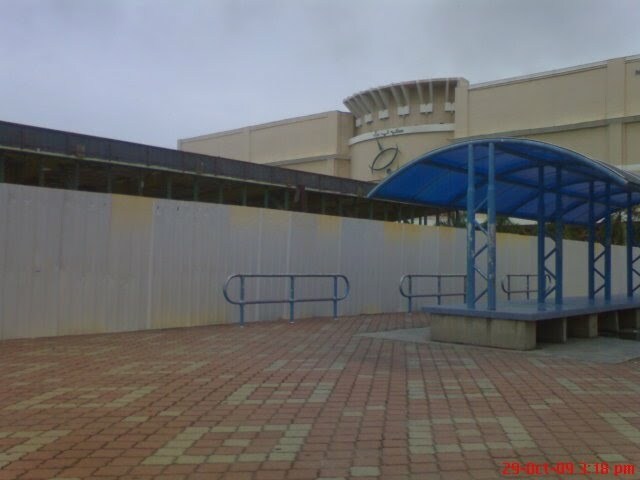 Anyway, thankful for this nearly-abandoned project not the like of Pelangi Mall’s 2006! Almost 10 years Abandoned Project! 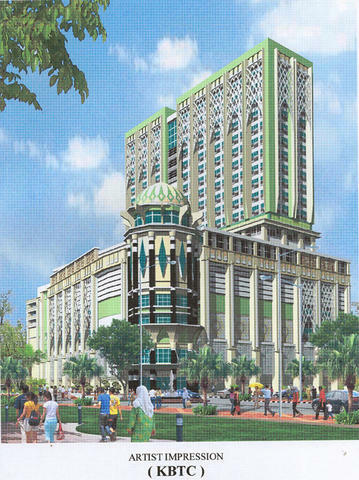 This project (see the blueprint below) expected to embarks in 1999 on 0.4 ha lands behind old-Tengku Razaleigh Hamzah townhouse situated in front of Jalan Sultanah Zainab (opposite to Istana Kota Lama). Now, Rough bush and hedge plant inside. Go fishing! (Stagnant construction). The seashore of rock! 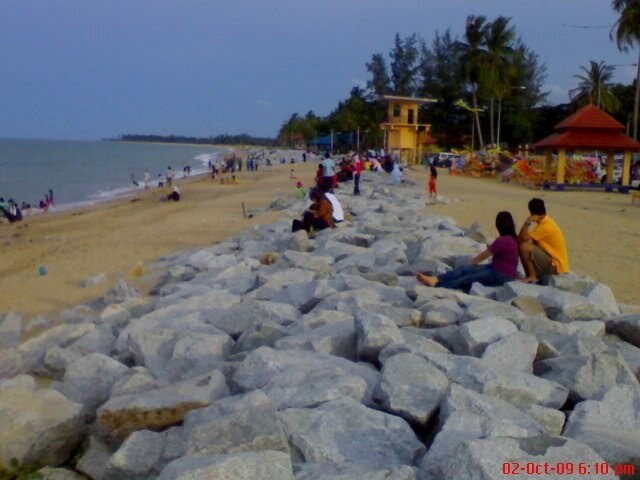 Newly-assorted hill rock at Pantai Cahaya Bulan underneath old’s 1991 Pantai Chenta Berahi sand seashore.This belated-conservation efforts by state government seem another losing for Kelantan Eco-Tourism. Good graffiti BUT not at the right place! 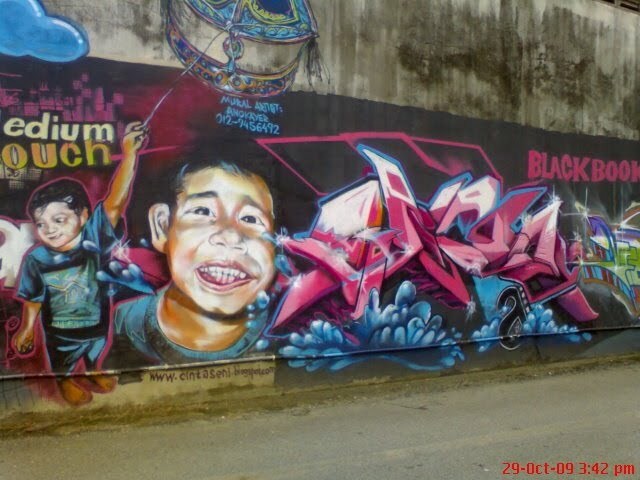 Image taken at Jalan Post Office Lama opposite Pelangi Mall shows the Kelantanese creativity and artistic works at mistaken hub. Propose this to Balai Seni Lukis Negara (National Arts Gallery) for research and monumental. CAUTIOUS! Plagiarism works is ALLOWED in cases for studies purposes or aiming for promotion, but CREDIT must be GIVEN as a means of APPRECIATION! Thank You. « Kelantan’s Mobilisation: Jalan Hamzah bakal berubah wajah! Terima kasih Muhammad Abdul fateh dengan maklumat ini. Kalau ada maklumat terkini boleh lah hantar kat saya di sini. Insya-allah, jika ada kelapangan saya akan hantar kepada Tuan. naper kebanyakan org2 KB ni (bukan semua) suka sgt hina negeri TRG? 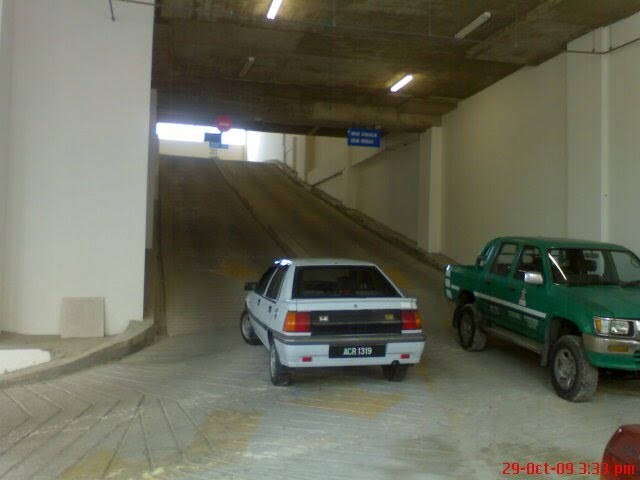 dh wat camner,stadium 2 nk runtuh….bukannya rakyat TRG nk pon ianya runtuh…..
KTC ramps were the worst.I could not comprehend why such design were approved by PBT. This is nothing to do with F contractors whatsoever. 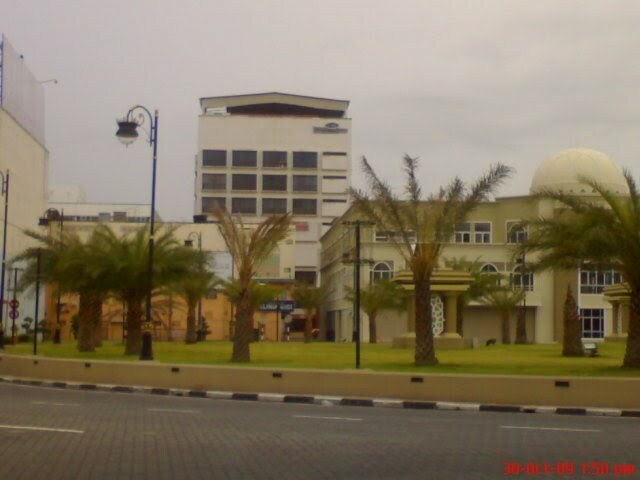 It is about design and approval.KTC is more like white elephant to me.Been there once.